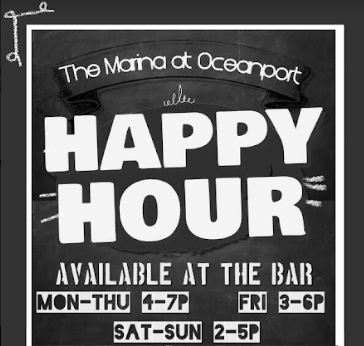 The Marina at Oceanport is happy to announce that they have new Happy Hour times and specials! Try one of our new January special cocktails, The Winter White Cosmo or The Winter Blues Mimosa, at one of our DAILY happy hours! Happy Hour at The Marina is available at the bar every Monday through Thursday from 4pm-7pm, Friday from 3pm-6pm, and Saturday and Sunday from 2pm-5pm. Indulge in their $2.50 beers including Coors, Miller, and Bud Light, their $4.50 House Wines, $5 House Mixed Drinks, and their $7 House Martinis with vodka, gin, rum, tequila or whiskey! You can't go wrong at The Marina. Opened in July 2015, The Marina at Oceanport is a family owned restaurant and bar tucked away on Oceanport Creek, a mile away from historic Monmouth Park Racetrack in Oceanport, NJ. The Marina marries a comfortable and causal atmosphere with flavorful new takes on continental style dishes. With both indoor dining and an outside deck and bar, the Marina is a great location to enjoy a meal on the water year-round!